at our 2F gallery on now exhibit and sale. We are look forward to seeing you soon. We will display more than 100 items from our collections. including Katana, Wakizashi, Tanto. Tsuba, and sword fittings. Signed Heianjo Nagayoshi (circa 1500). 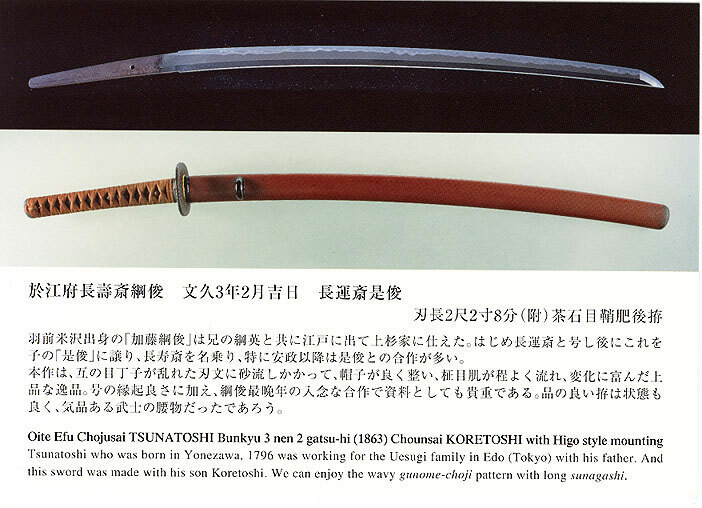 Blade length = 2 shaku 2 sun 4 bu (68.2 cm). Accompanied by a Juyo Token certificate issued by the NBTHK in 1999. 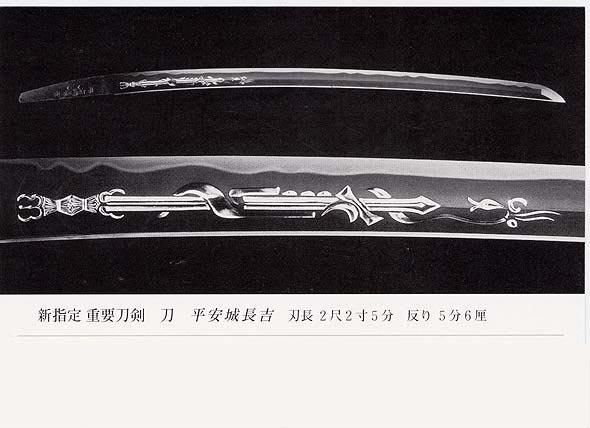 Kurikara Ryu, Dragon with sword engraving on the blade. (Illustrated above photos) Publication; Token bijutsu April 2000 edition by NBTHK. Unsigned Yamato Shizu (circa 1350). Blade length = 2 shaku 2 sun 4 bu (67.9 cm). Accompanied by a Juyo Token certificate issued by the NBTHK in 1999. Signed Izuminokami Fujiwara Kunisada (circa 1620). 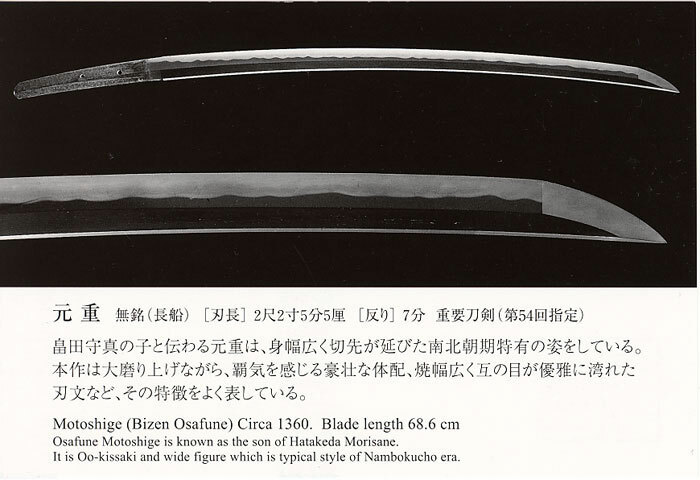 Blade length = 1shaku 1 sun 9 bu (36.1 cm). Accompanied by a Hozon Token certificate issued by the NBTHK in 1999. Dragon designed openwork on the blade. Unsigned Soshu Sitahara Terushige (circa 1570). 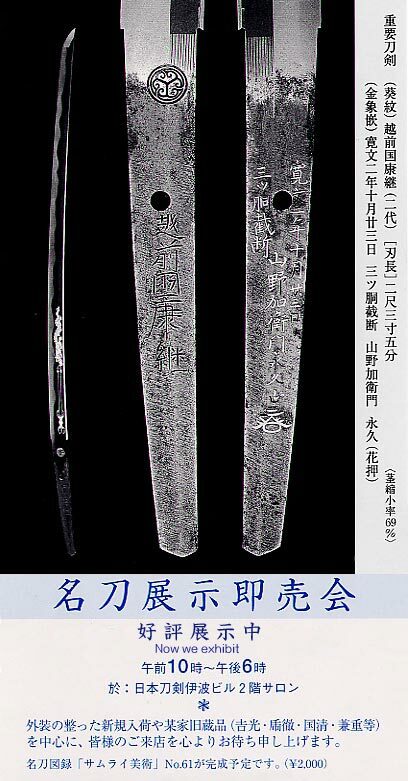 Blade length = 2 shaku 1 sun 3 bu (64.5 cm). Accompanied by Hozon Token certificate issued by the NBTHK in 1999. 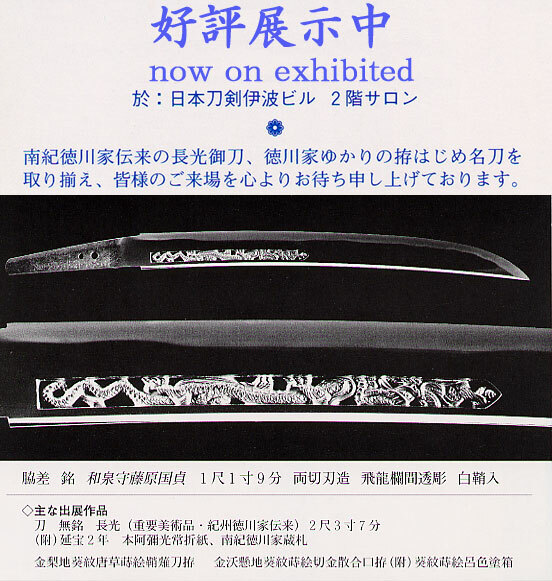 Kurikara Ryu, Dragon with sword designed engraving on the blade. by the NBTHX in 1999.
national treasure, certificate issued by the NBTHK in 1999. For further information, please contact us by fax.